In last week's post on celebrity comics appearances — and some of my earlier work to index them — I mentioned that there were a lot more photo-covers throughout comics history than readers of today's comics might imagine. Gale Storm, who passed away at 87 this weekend, is proof of this, appearing in and on the covers of more comics than most TV stars of the last generation. Started as a summer replacement for I Love Lucy in 1952, Storm's popular My Little Margie series bounced back and forth between CBS and NBC — even airing for a while on CBS' radio network in original episodes made just for audio with the same stars. After the show left the air in 1955, she starred in The Gale Storm Show on CBS and then ABC — making her a prime-time fixture for most of the 1950s. 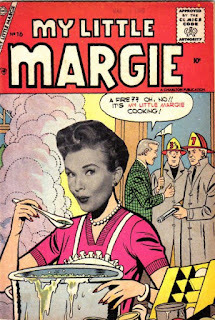 She appeared on the comics racks, too — Charlton's My Little Margie ran 54 issues from 1954 to 1964 — longer than either TV series combined. (Overstreet values the final issue, featuring Margie fawning over The Beatles, over any issue of the series but the first.) 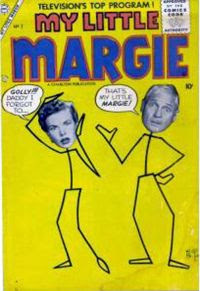 Charlton would do at least 70 Margie comics, including issues in two spinoff titles. 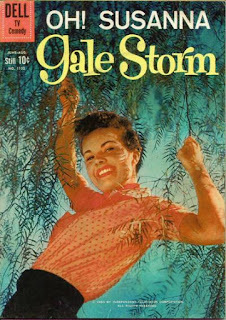 Dell, meanwhile, had the rights to The Gale Storm Show, where Storm appeared on the cover of Dell Four Color #1105. Which brings me to a couple of points: First, yes, the photo cover data is included in the new DVD version of The Standard Catalog of Comic Books — though how quickly you can search for individual names depends entirely on your computer, since it's in PDF form. Second, looking at the covers of Storm's comics — may she rest in peace — reminds me of something I noticed doing research for the Catalog: You can see just from the photo covers how widely publishers in the 1950s and 1960s varied when it came to such things as their technical abilities and studio cooperation. Dell's photo covers were usually first rate — promotional stills reproduced fairly sharply in good color, with few artifacts from cropping. I'm an old fan of TV comics — years before my first pro comics writing work, I developed an I Love Lucy series that never appeared, running aground at its publisher on licensing issues. They're a reminder of a different time — and that comic books inspired by stars like Gale Storm once had quite a long run in the world of comics. And while photo covers today are more of a sales tool for variants, they were once standard operating procedure for a lot of publishers. Some procedures were just more sophisticated than others!